Well I got a little bored this evening and started to play around with the Microsoft Surface SDK. Nothing too exciting in this first iteration, but I wired it up to my Twitter account and started pulling down new tweets every couple of minutes. 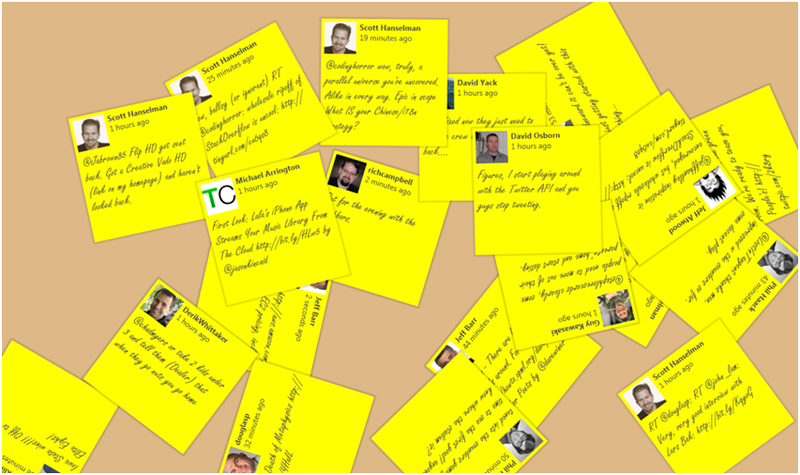 With a little styling I was able to get each of the messages to look like a handwritten Post It note. The messages are created using the ScatterView control which is a Microsoft Surface specific WPF control that allows each item to be picked up, dragged, resized, and even thrown around the screen. Microsoft uses this control a lot during demos of the Surface, wiring it up to pictures to provide a table full of photos type environment. Why is this a $12,500 Twitter client? Well because that is how much it is going to cost you to get a MS Surface, or $15,000 for the developer version. Though, if you buy one in the next 15 minutes, I'll throw in this nifty Twitter client for free.